Rittirong Damrongkitkanwong is aey Viper in Second Life. The international nature of virtual worlds and of New Zealand education in general is typified by Weltec student Rittirong Damrongkitkanwong, from Phuket Thailand (SL: aey Viper) who is in his third year of a Bachelor in Information Technology programme. As a class project he has created a”follow the instructions” demonstration of how to set up a Surveying Level. Other students in the class have created scafolding use projects and one a plastic moulding machine. Damrongkitkanwong (pictured right), 22, has been at Weltec for four months after doing diplomas at Tairawhiti polytechnic, in Gisborne, New Zealand. 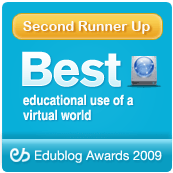 His experience as a virtual world student demonstrates again that patience, persistence and time are needed if one is to get the best from a virtual world education. Not fazed by the learning curve of virtual worlds, he believes Second Life provides an interesting, new way of learning which is “not boring”. “I think it is an interesting high technology tool to use for teaching and learning especially for interaction design classes,” he said. “‘In the virtual world I never feel bored. I have a lot of fun doing my assignment. ” It was hard at the beginning learning how to move and building things, but after a while, after spending a lot of time in Second Life doing all the hard work, I now feel it is easy to build things and add animation to it(scripting). However, spending MORE time (in world) is the emphasis here, dealing with the problems, solving them if you can. On graduation Damrongkitkanwong plans to work towards his Masters at Victoria University, Wellington, specialising in computer science, before moving into programming. He still sees his main problem in initially adapting to Second Life as scripting, adding scripts and working with scripts. The class is run by SLENZ developer, Todd Cochrane (SL: Toddles Lightworker).